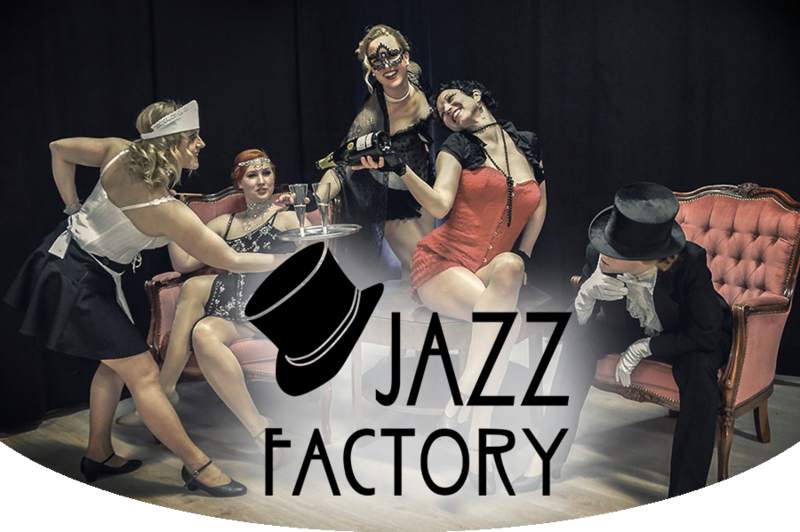 Jazz Factory offers classes in Authentic Swing & Blues dances, brings shows to your parties, rents out its studio and organises dance events with live music and cabaret shows with All That Jazz! Jazz Factory offers professional and fun DANCE CLASSES in Authentic Swing & Blues dances. Dance styles such as the 20’s Charleston, Authentic Jazz, Lindy hop and Blues all belong to Jazz Factory’s repertoire. Most of these dance styles can be danced solo and as partnered dance. Classes are given in the form of regular weekly classes or intensive workshops, from absolute beginners to advanced dancers. LAURA trains students, performers and teachers alike, choreographs dance numbers, directs and shows and also performs on stage herself. You can also book perfomances, workshops, tailor-made group classes or private teaching in your preferred dance style to an event and location of your choice. Laura & her Jazz Factory has had an active role in helping the swing & blues scene of Helsinki grow and flourish by organising dance-related activities and EVENTS both at the studio and elsewere. One of Jazz Factory’s trademarks is the annual, stylish Speakeasy nights held at Casino Helsinki’s gorgeous Fennia salong. These atmospheric social dance evenings make you travel through time to the 1920-1930’s prohibition era with its gangsters, showgirls and various entertainers; the evenings include fantastic live music, authentic swing & blues DJs and, of course, the most tickling and memorable cabaret shows. Jazz Factory is also the home of MIDNIGHT FOLLIES, a vintage dance performance group under Laura’s lead. The core of Jazz Factory’s cabaret, this group leaves no audience cold; the Follies bring life, laughther and sparkle to any event and, indeed can be booked also for private events. The beautiful and intimate Jazz Factory DANCE STUDIO can also be rented for own use. The studio is in a prime location in Helsinki with good metro, tram and bus connections, and close to free parking space. For the available times to rent the studio, see CALENDAR. Copyright © 2019 Jazz Factory.